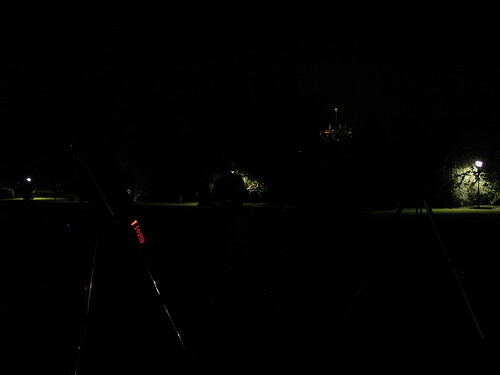 Amazingly, after what seemed like ages of solid cloud blanketing the town, Stuart Atkinson arranged a clear night for the latest International Year of Astronomy, 2009 event, the Eddington Society (who tweet here) JupiterWatch in Abbot Hall park, Kendal. 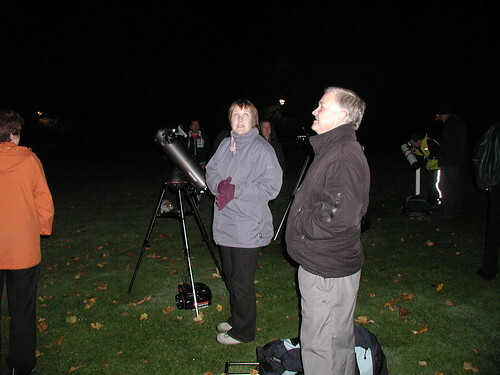 The event consisted of several hopeful astronomers standing in a park in central Kendal by the church, hugging their telescopes and showing some of the easier to find but more instantly spectacular sights of the night sky to all and sundry. Fortunately, Jupiter was a little easier to find, a bright white star fairly low on the horizon but high enough for a look. Three reflectors and one refractor of varying sizes and tripod heights took a view of this (once mine had arrived a bit late due to the eyepieces not travelling with me to begin with…). Jupiter presented a nice clear disc with four moons all one one side (as it happens, there was an eclipse of one of the moons by another at 22:10, but that was long after the watch). The bands were nice and clear. The other three scopes remained on Jupiter, but mine was soon on the move to the galaxy Andromeda, as requested by a member of the public. 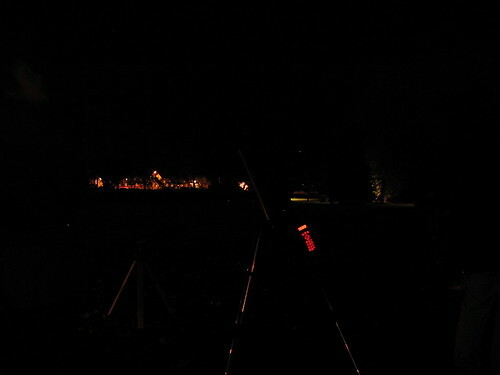 This provided a view mostly of the galactic nucleus, the mist, nearby lights and cars coming down a badly positioned lane across the river all worked in concert with the clouds to occasionally cleave away better contrasts. Other things were happening in the sky. The satellite Iridium 67 caught the Sun at 20:40, providing a magnitude -7 flare, only slightly out of the constellation we were assured it would appear the other side of. I caught a couple of snaps, but zoom would’ve helped bring out the trail over the second long exposures. 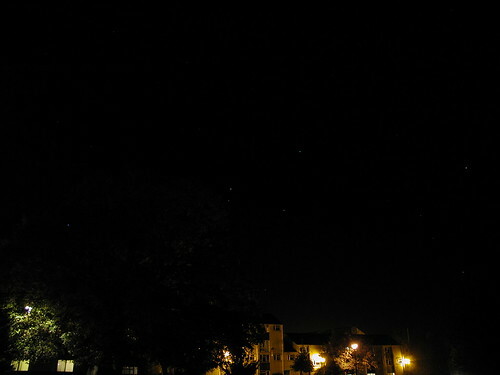 Another satellite flared up shortly after and many satellites turned out to pass over us during the time we were out. A fast meteor streaked through about fifteen degrees of the sky with a slender, silver trail. 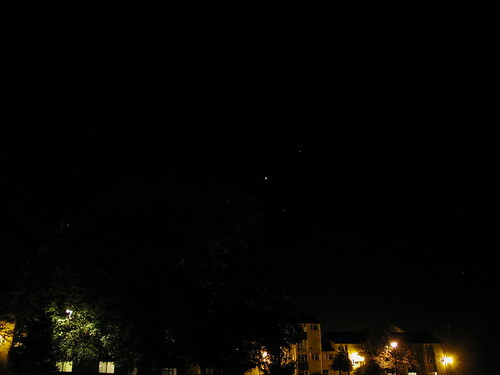 I saw another similar effort later in the night from a darker sky area. The final target for my scope for the night was another request – the Pleiades (there was a request for Uranus, but it was in an awkward spot). I got the scope onto it for a lovely view of that bright blue jewel box above the Hyades. I didn’t expect the colours to come out as well as they seemed to do. After we’d all packed up and gone home, it was a cup of tea and twitter for me, before venturing back out into the broken cloud for a quick sortie into darker skies. Orion, the Hyades, the Pleiades, the band of the Milky Way, Andromeda – it is a busy, busy naked eye sky out there and there’s even more to be seen with even a small scope or binoculars. And thanks to Stu’s efforts, there’s a few more people that have seen it. My photos of this event are in the Eddington AS set on my flickr account. The next observing event is a week on Tuesday, 27th of October, same place, same time – MoonWatch, part of the SPA‘s Autumn Moonwatch. 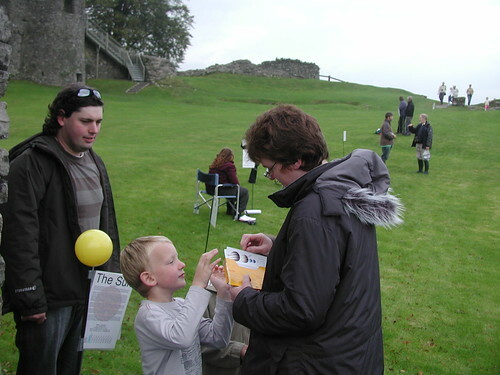 Yesterday, Saturday October 10th, saw the Great Kendal Solar System Scale Model arrive at Kendal Castle. 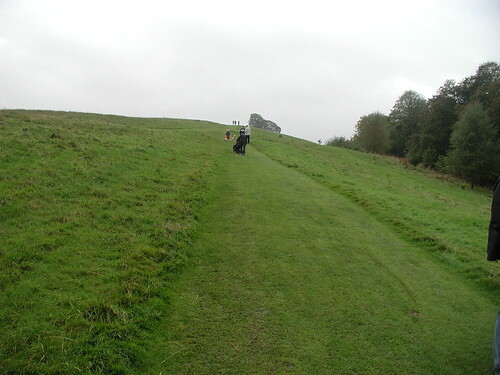 Between 200-250 members of the public (plus assorted dog walkers) came up to see the event. 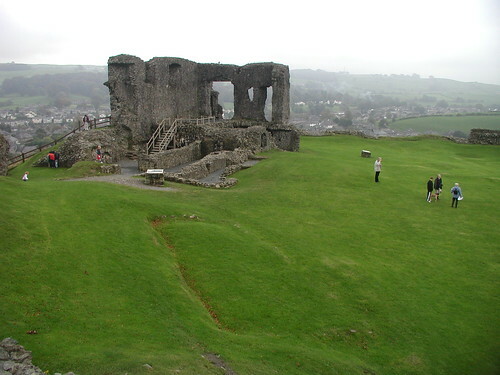 There was a family from Nottingham weekending in the town, who heard about it and popped along, and people from Windermere who came along especially to see it. But what did they see? 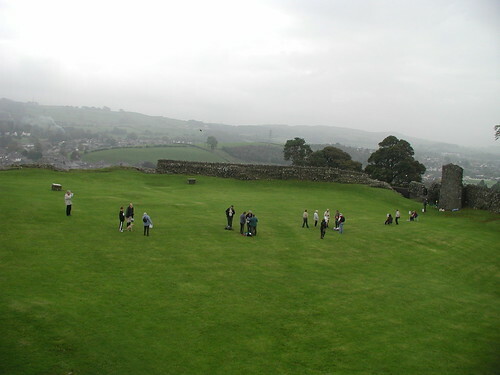 Stuart Atkinson, the organiser, had worked out beforehand the distances required to fit a model of the solar system into the grounds of Kendal Castle. The inner planets, the asteroid belt (represented by Vest and Ceres) and all the distance up to Jupiter fitted from one end of the inner walls of the castle right up to the front gate. 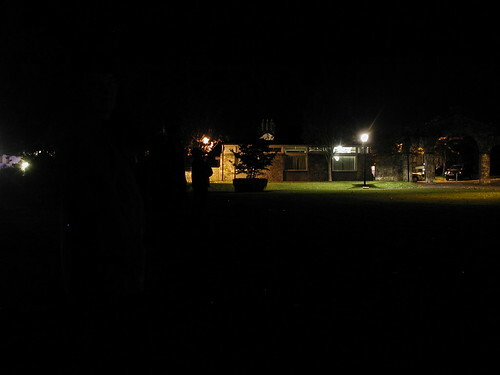 From there, Saturn, the current position of the New Horizons probe to Pluto, Uranus, Neptune and the dwarf planet itself were lined along the path to the gate. 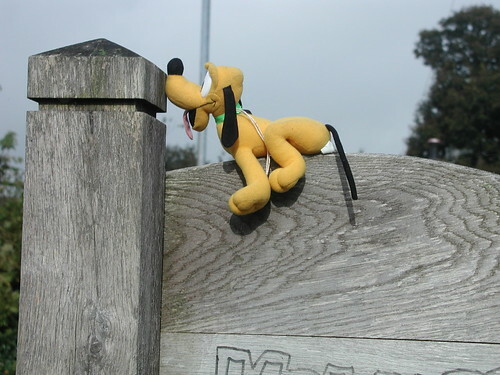 An unexpected drop even meant Pluto’s larger than average inclination seemed to be represented. Doug Ellison of the Unmanned Spaceflight Forum agreed to help Stu and created scale models of the planets to be pin mounted, the pins placed in bamboo canes and the canes, flying flag like information sheets, placed at those points marked out. In an emergency, the pike like implements can also be used to quieten any opposition we get. Helpers like me had to stand by our posts and impart facts to the various people who wandered along the route. 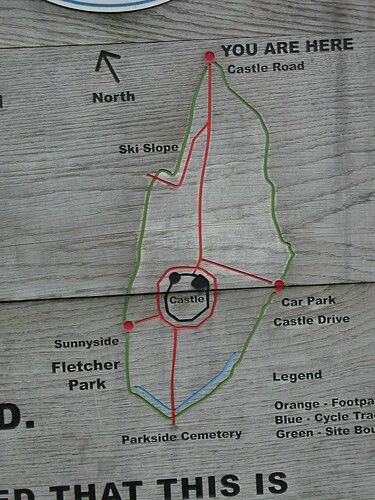 Many already knew about the planet walk from various radio stations as well as mentions in the Westmorland Gazette, however others merely happened on the model as they walked the castle with or without their dogs. As it happened, both the model sun and the actual Sun lay in roughly the same direction looking from where we were. They were greeted by me, Dave, a soft toy (Pluto the dog) and our cane representing the outermost body Pluto. 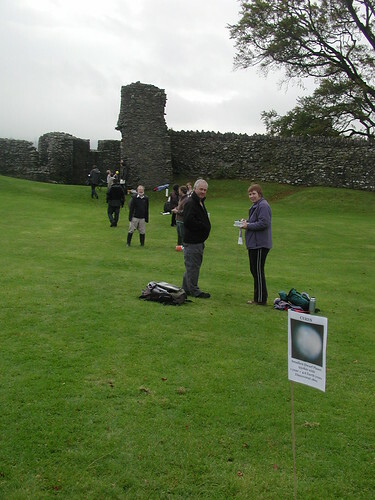 Those who had braved that then continued up the path, occasionally passing Neptune, Uranus, New Horizons and Saturn before arriving at the castle gates. 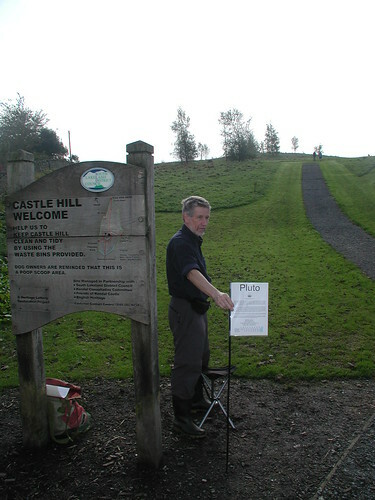 Some people had brought information leaflets to hand out to the passing hordes, as well as the occasional chair, Graham Fell used his castle gate position to set up an entire stall of paraphernalia. And this was just an intimation of what was inside. Having passed through the well distanced outer planets, people arrived at the castle to find a very well populated inner solar system, with asteroids and terrestrial planets a plenty, all crammed within the walls. 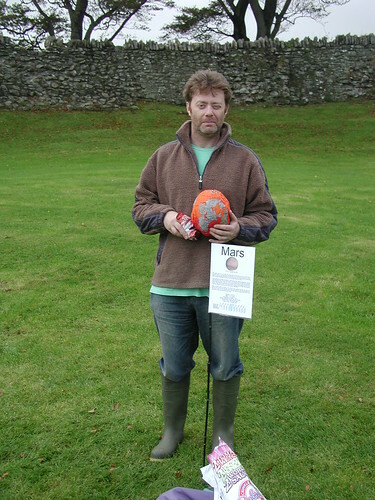 At the very end, Doug had his own take home leaflets and solar system scale postcards to give away. 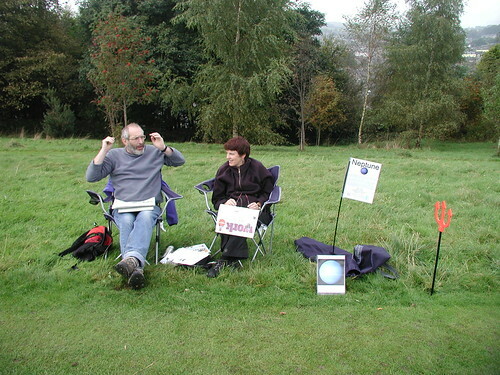 The event was a great time to popularise the Eddington Astronomical Society as well as point every towards the Our Amazing Universe exhibition at Kendal Museum, not to mention a boon for the International Year of Astronomy, 2009 and a good day out for all involved. It didn’t even rain, though we had some atmospheric mists. And for the future? In his write-up, Stuart Atkinson suggests the model may well be back again next year. All my images of the event are here. 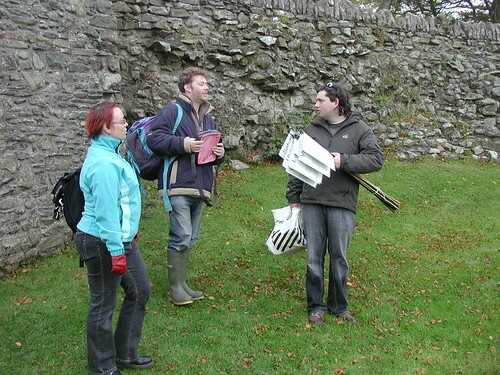 Twitterers involved in the model include myself, Stuart, Doug and Bellatrixlestar. I’ve noticed a few articles on comets and asteroids doing the rounds at the moment, so I’ve gathered them all here rather than do loads of posts. Asteroid TC3 2008 might not be an evocative name, but the piece of rock was spotted shortly before it entered Earth’s atmosphere, allowing a rare glimpse of an asteroid as it travels through space before hitting the Earth. The thing exploded over the desert in Sudan and 222kg of it were recovered, allowing meteors as they are normally found to be studied knowing how the asteroid appeared in our telescopes. This was the first time a definate link could be established between the results of the laboratory and those of the telescope. Examination of the pieces has yielded interesting information. Not only is the asteroid of a rare type, but it’s a bit of an oddball even for these rare types. It contains signs of having been blasted off a larger structure by a powerful impact, with the mineral olivine turned to iron and carbon heated to the extent of producing nanodiamonds. Organic materials such as amino acids survived both this and the tumble down to Earth. And tumble was the word. Looking at how the brightness (magnitude) changed in the telescope eyepiece, the astronomers determined that the asteroid was shaped like ‘a loaf of walnut-raisin bread’, tumbling over and over. As the Sun reflected off the changing apparent size of the thing, the brightness altered. A movie or two of the asteroid in space as well as further information on the topic can be found in this Astronomy Now article and related links. Using the same idea as above, astronomers at Lowell Observatory have measured the rate at which the nucleus of comet 10P/Tempel 2 spins. The nucleus is shaped like a rugby ball and if you look at it end on, you see a smaller area than a side view gives, this means less light is reflected in your direction and so the thing dims. Using this to clock the rotation rate, a team led by David Schleicher determined that the comet’s spin has declined by a rate equivalent to ten seconds every five years. Tempel 2 is described as a fairly anemic old comet, developing a crust of inert materials after many travels round the Sun removed the volatiles in the original article. One rather more pristine comet was Lulin, travelling in from its home a light year away, this comet visits once in a million years and became naked eye visible in February. Its progress through the solar system was rapid, allowing little time for observations, but a team at Lowell managed it. 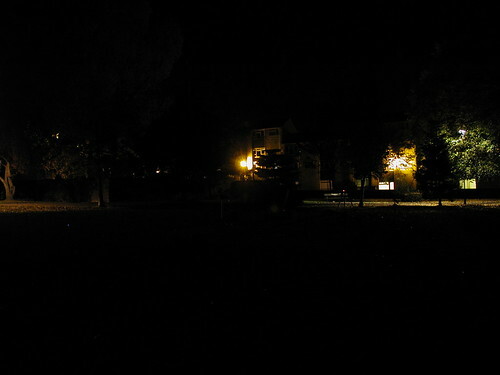 Unlike the two objects above, Lulin’s rotation rate wasn’t measured by changing brightness. As it was new to this Sun warming it up thing, the comet vented some unusual chemicals, cyanogen, from holes near the poles. These holes could be tracked from their exhaust, not only allowing the rotation rate to be studied, but maybe even allowing a 3D model of the surface to be built up, according to this Discovery News article. The GalileoMobile, carrying astronomers through Chile, Bolivia and Peru, is on its way for its two month mission to bring astronomy to those less likely to have the means to study it in depth. The van will carry the team to workshops and star parties. It will also include film-makers and translators on parts of its journey. 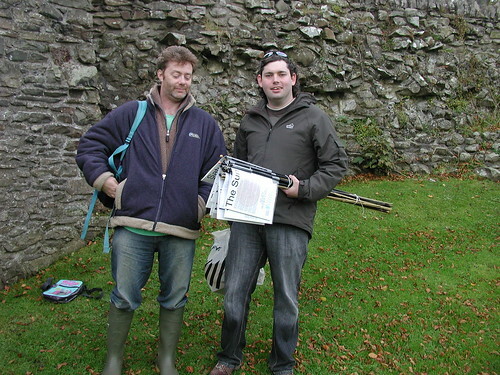 The journey is a project of the International Year of Astronomy, 2009 to bring educational materials to schools and communities that are deemed underserved in this area. Updates will be kept on its blog, facebook page, flickr account and twitter feed. The beginning of next week sees a couple of chances for the media to link up to the International Space Station. Firstly on Tuesday, NASA will be holding a conference at 8:55 CDT, involving all the present residents and news agencies from the USA, Canada and Europe. This will be streamed live on NASA TV. Further info can be found here. ESA will be hosting a news conference with the newly appointed Commander of the ISS, Frank De Winne, at the Columbus Control Centre near Munich in Germany. Media registration starts at 14:30 and those who wish to attend should go here to apply for a place. The pioneers of the CCD camera, which led to developments that gave us the digital camera and improved astronomical data, have been honoured with the 2009 Nobel prize for physics. Charles K. Kao, who worked on the transmission of light through optical fibres shares the prize with Willard S. Boyle and George E. Smith, who came up with the Charge Coupled Device, or CCD, which uses the energy of incoming photons to excite electrons into boundaries that can then be read out. This means that CCDs have a linear response to the colour of light that comes its way, as opposed to film, whose response is dependent on the particular mix of chemicals used in the exposure. This has allowed far greater consistency in astronomical measurements. Steven Sqyres, the principle investigator (PI) of the Mars Exploration Rovers Spirit and Opportunity, both now past the 2,000th Martian day in their 90 day missions, has won the Carl Sagan Award for public outreach from the American Astronomical Society. The mission is unusual in opening up its data to people directly through the web. At the moment, with Spirit trapped in the Martian red dust, a ‘Free Spirit’ campaign typical of the type of thing the mission team comes up with, has been running.